After the school birthday party, Ms. Alejandrino shared with us about the Philippines. Ms. Alejandrino shared with us about the many different fruits you can eat in the Philippines, but don’t see in Japan. For example, durian, mango, chico, rambutan, atis (sugar-apple). The Langka (Jackfruit) tastes like the combination of four different fruits! She also showed us different games children like to play in the Philippines and we even tried the game Sasara Ang Balaklak together with our classes. 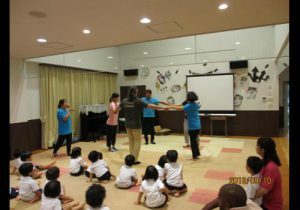 For this game the group makes a circle while holding hands. Then the “queen” enters the circle and chooses the next “queen” by pointing with her hip to a person in the group. Q: What 4 fruits does the Langka taste like? A: Apple, banana, pineapple, and mango.